I feel awful about it, as if I have betrayed a trust and imagine the old thing turning her headlights to the wall and shedding a single tearful indicator bulb at being passed over for a younger model. Well, at 6 years old Daisy is no spring chicken, but offers us a few more years of reliable service - more than we could hope from Gertie. It was only in my previous post that I said Gertie's name was Doblo Seven, as far as I was concerned, but 'wee-Margaret-who-knows' from the village, (a lovely lady who knows everything about everything in Mid-Argyll and beyond) insists that she was called Gertie, and furthermore, says that Milady told her that was my name for her (the car that is)! Milady decided unilaterally that the new chariot should be named Daisy; because "she looks like a Daisy". This leads me to Elsie and Doris Waters, sisters of one Horace Waters, perhaps better known as Jack Warner the famous British actor, best known for his portrayal of policeman Dixon of Dock Green on BBC Television, which ran from 1955 to 1976. Elsie and Doris were a double act, much loved during World War II, and were known as Gert and Daisy. This is not to suggest that our motor vehicles are in any way the same as a two comediennes. I am sure that Elsie and Doris were much funnier than a Fiat Doblo and a Renault Kangoo could ever be. 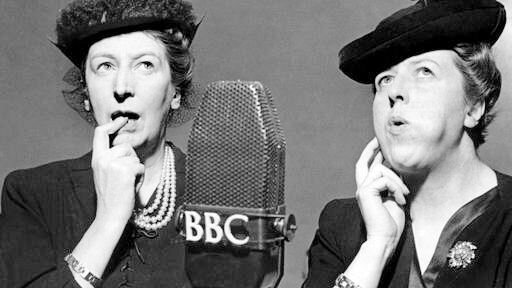 And Elsie and Doris co-existed - an essential element in a double-act. I am unaware if Elsie ever did a monologue, only to hand over to Doris when Elsie was sold off for parts. All this is fruitless speculation, but then that is rather the point of this blog, really.